It is nearly impossible for a third party to decide if buying a home is in your best interest. For each individual, a number of factors come to play in the home ownership decision. Whether that be how long you plan to stay, what home prices are doing in your market, what your current renting situation is like, etc. 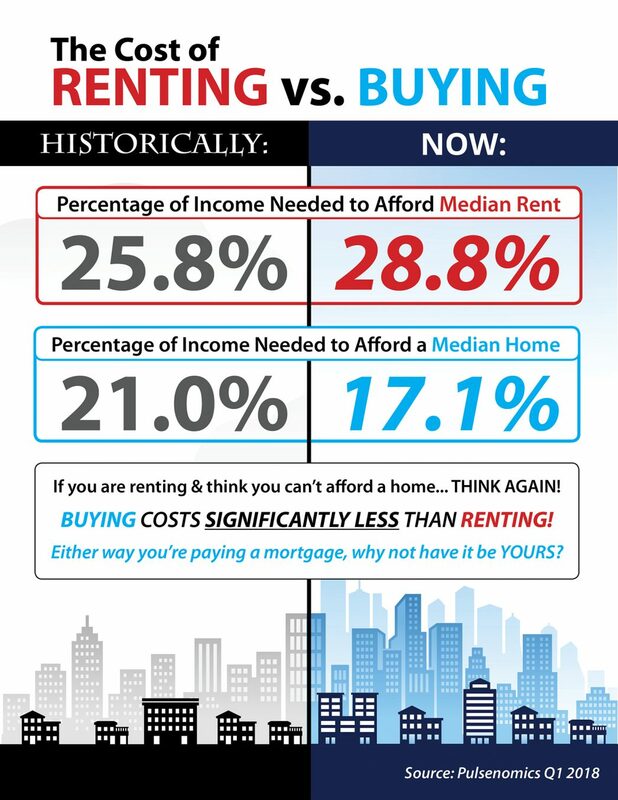 According to Keeping Current Matters, however, buying a home is cheaper than renting in the majority of the United States. Looking at the percentage of income needed to rent a median-priced home today (28.8%) vs. the percentage needed to buy a median-priced home (17.1%), the choice becomes clear. The 2018 Rental Affordability Report from ATTOM Data Solutions complemented KCM’s report, by showing that buying a median-priced home is more affordable than renting a three-bedroom property in 54% of U.S. counties analyzed for the report. It was reported that average rent rose faster than income in 60% of counties, as well as faster than median home prices in 41% of counties. Even in places like Portland, Oregon, where the rent and monthly mortgage prices are nearly even, buying comes out just a touch cheaper— with a bit more of a reward at the end and less stress in regards to the overgrowing city with rising rent! Of course every market is different. The most common “argument,” however, is why pay someone else’s mortgage when you could be paying your own? Your new home could be closer than it appears. Before you renew your lease, use this New York Times Rent vs. Buy Calculator to see if home ownership is the better option for you and your family.